Description: Tuesday morning Masses are held in the chapel on the 61st Street side of church. Description: The Baptism Preparation Class will be held in the Parish Office Complex. You MUST pre-register by calling the Parish Office at least three days in advance. Description: St. Vincent de Paul meets in the Convent. Description: Earth Angels meets in the Convent. Description: The Human Concerns Committee meets in the Parish Office Complex. Description: The Parish Life Committee meets in the Parish Office Complex. Description: The First Eucharist Retreat will be held in Arnold Hall. Description: The Tailgate Party will be held in Arnold Hall. Description: Formation Committee meets in the Parish Office Complex. Please use the Parish Office entrance on 61st Street. Description: RCIA meets in the Parish Office Complex. Description: The Blessing of Easter food will take place in Church. Description: Pastoral Council meets in the Parish Office Complex. 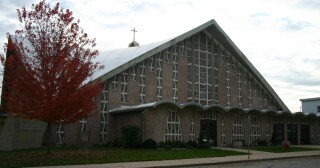 Tuesday morning Masses are held in the chapel on the 61st Street side of church. The Baptism Preparation Class will be held in the Parish Office Complex. You MUST pre-register by calling the Parish Office at least three days in advance. St. Vincent de Paul meets in the Convent. Earth Angels meets in the Convent. The Human Concerns Committee meets in the Parish Office Complex. The Parish Life Committee meets in the Parish Office Complex. The First Eucharist Retreat will be held in Arnold Hall. The Tailgate Party will be held in Arnold Hall. Formation Committee meets in the Parish Office Complex. Please use the Parish Office entrance on 61st Street. RCIA meets in the Parish Office Complex. The Blessing of Easter food will take place in Church. Pastoral Council meets in the Parish Office Complex.